Can't fool me cover. I know Bachalo is inside! Give me Chris Bachalo or give me death! I love everything Bachalo does, but I especially love his portrayal of Spider-Man. So when I picked-up X-Men #7 my wait for his art was finally over; however, besides a page at the very end of the book, I did not receive my Bachalo-Spidey fix. From the cover, one can clearly see that Spider-Man was going to be apart of the X-Men story, yet the fashion in which he would appear was unknown. Needless to say, the one page at the end was not enough. Disappointed would not be a word I can use with X-Men #7. That would be like saying I'm disappointed my sports team didn't win by more points. A win is a win. 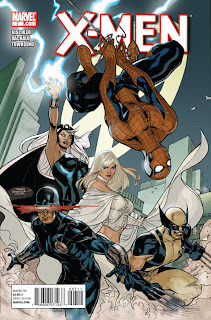 I should be happy my team (team - Chris Bachalo...mascot - Spider-Man) was at least in the game and came out with a victory. The overly excited fan in me always wants more. And that is exactly what next month's sure to be future comic of the day X-Men #8 will be...more. Much Spidey-filled more. Besides my anticipation thoughts, X-Men #7 did have some great art work. At times some of the paneling was a bit confusing, yet other panel work was absolutely fantastic. One specific sequence where Bachalo draws the group of X-Men traveling through the sewers by constructing the panels together like a long sewer system was a particular treat.